Astigmatism is a condition that results in blurred, unfocused, or fuzzy vision. 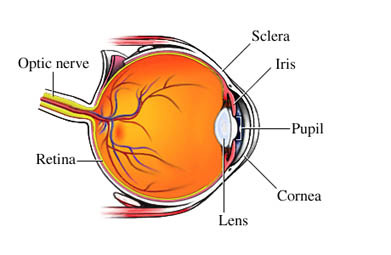 The cornea (front surface of the eye) or lens (located behind the cornea) has an abnormal or irregular curve. The precise cause of astigmatism is unknown. It is often present at birth and may occur with nearsightedness or farsightedness . Sometimes, it may occur after an injury or eye surgery. Symptoms vary depending on the extent of the astigmatism. You will be asked about your symptoms and medical history. An examination of your eyes will be done. Corrective lenses, such as glasses or toric contact lens, are prescribed to offset the eye’s visual abnormalities or defects. To correct severe astigmatism, an eye surgeon might use special knives or a laser beam to correct the abnormal or irregular curve of the cornea. There are no current guidelines to prevent astigmatism. See your eye doctor for regular check-ups. Astigmatism. American Academy of Ophthalmology website. Available at: https://www.aao.org/eye-health/diseases/what-is-astigmatism. Updated March 1, 2017. Accessed December 14, 2017. Astigmatism. American Optometric Association website. Available at: https://www.aoa.org/patients-and-public/eye-and-vision-problems/glossary-of-eye-and-vision-conditions/astigmatism. Accessed December 14, 2017. Mozayan, E, Lee, J. Update on astigmatism management. Curr Opin Ophthalmol 2014 Jul;25(4):286-90. Facts About Astigmatism. National Eye Institute website. Available at: https://nei.nih.gov/health/errors/astigmatism. Updated October 2010. Accessed December 14, 2017.